This was the album that made Zorn a household name (well, at least among really hip households). Although nine of the ten songs on the album were covers, they all bore the unmistakable touch of a single arranger with a very bold style. They not only cut to the heart of the Morricone songs, they also revealed an original musical mind arranging the pieces. 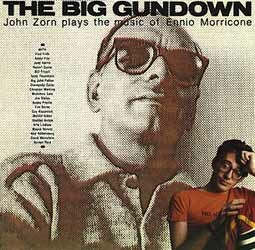 Both Zorn and Morricone are well represented here. This is definitely Zorn's work, from the three electric guitar attack of Fred Frith, Jody Harris and Arto Lindsay on "Milano Odea" to the mural like quality of "The Big Gundown" which is the most visual peace of music I have ever heard. This album is also an excellent representation of Zorn's 80's studio recordings. These "vertically layered" albums rely heavily on mixing and overdubbing to achieve their caucaphonous, multi-layered sound. They spark the imagination with the various sounds and styles inducing powerful visual images in the listener's imagination. Anthony Coleman - piano, harpsicord, organ, vocals.